My client was recommended by a friend to be screened for Irlen Syndrome at my Clinic. As is often the case someone else in the family (his grand-daughter) has the Syndrome and is already using an overlay. 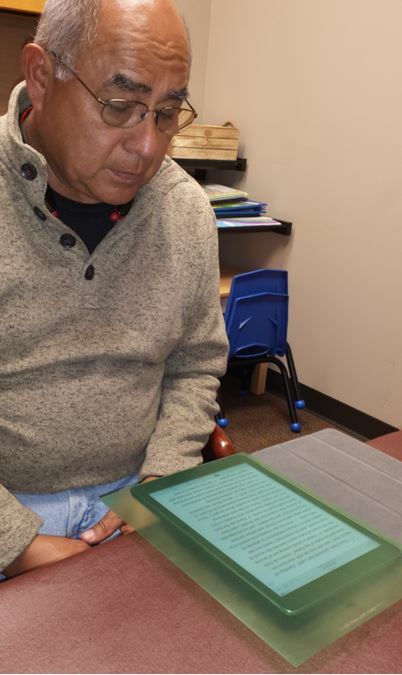 My client is 65 and he had never been able to read for more than a few minutes without the words becoming blurry. Indeed when this happened and he looked up everything else was blurry too and he felt dizzy. He would try to make things clear again by shutting or rubbing his eyes. He would feel unable to concentrate and just wanted to get the reading over with; it was difficult for him to understand anything he read because he had to put so much effort into trying to see the words. My client wishes to tell you that it is never too late, whatever your age, to be screened for Irlen Syndrome, especially if you know of a family member who experiences the condition. He has shared his story to spread awareness.